We had our first local internet straw poll and the results are in. John Prescott did not win. None of the party candidates won. It feels strange to say but i did in fact win this poll which was held online from 16/08/12 – 20/08/12. Its hard to understand how i won this poll when you consider the odds were stacked against me winning. Ive got less than 100 followers on twitter and 220 friends on Facebook and John Prescott has over 150,000 followers on Twitter and a few thousand friends on Facebook. I’m not making up these figures. 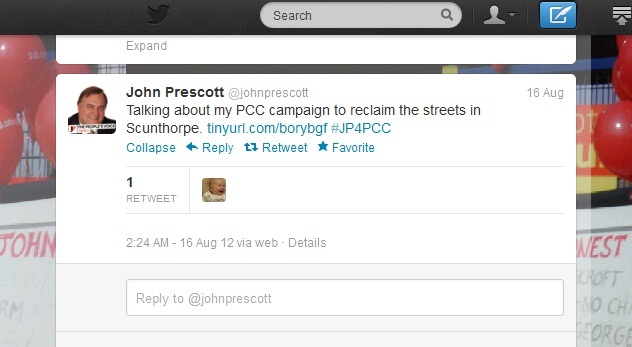 John Prescott has an online following that blows mine out of the water! So how has this happened? how is it possible that someone with over 150k in twitter followers can lose an online straw poll? of course there would have also been a lot of local people who read the website and they too would have voted in the poll. Johns twitter feed like mine posted the link to the poll on twitter. The poll win does clearly show that the general populace would in fact prefer an independent candidate, a normal person, who does not take orders from a political party or from very wealthy lobbyists. Ill be the first to admit that an online poll allows the haters to come out and vote against John Prescott. A certain amount of those votes cast my way were probably people who voted for me simply to take the victory away from him, but it was me they voted for, not the Tory or UKIP candidate, or even the other independent candidate. The Tory candidate finished in dead last with 6% of the vote. where was his support? the only two candidates who tweeted the link, as far as i can tell were John and I. There was no tweet for any other candidate which is strange as the poll was conducted online so twitter is the perfect platform to get the vote out. I hope that other independent candidates get in touch with their local papers with online publications and look to do the same thing i have done. Secure a victory! It doesn’t matter that some sections of society down play the relevance of the victory. It doesn’t matter how they belittle the results or make them unimportant. Its still a victory. Take heart independents, the public in general has spoken. They will not be ignored. They will not roll over and accept dozens of newly elected party stooges. They want the non political option, the normal person who is interested in the issues. They want to keep politics out of policing. They want one of them! here is the final result after the 4 days of polling.